The character and inherent beauty of the West Village neighborhood speaks for itself. Our goal was to honor this historic appeal while creating new residences with a modern design sensibility. So we developed a take on luxury that is unique to the West Village—one all about fitting in, rather than standing out. Low-profile and more intentional. Taking care of the environment and sustainability were critical components of our vision, so we used green architecture and design throughout. This approach earned 150 Charles a Leadership in Energy and Environmental Design (LEED) Gold certification and recognition from U.S. Green Building Council. Bringing that environmental focus into residents’ experience, 150 Charles was designed to let residents retreat to open-air gardens and cascading terraces—creating connections with nature and providing unobstructed views of the Hudson River. At the same time, the building was one of the first to offer West Village residents a full set of luxury amenities. The location puts them in the heart of one of New York’s most distinctive neighborhoods. Subtle and intentional, 150 Charles was built to be authentic to the Village, but utterly inimitable. At 150 Charles, forward-thinking design meets classic neighborhood values. We did not simply throw a bunch of glass, glitz, and glamour onto a living space for the sake of it. Rather, we focused on making the ways residents would live, play, and interact more luxurious. While the building’s presence to passersby on the street is meticulously designed to blend in, the interior design is a stunning sight to see. There is a dedicated focus on circulating light and air into the elegant, open spaces. Apartments boast high ceilings and floor-to-ceiling windows that welcome this natural light, while also framing scenic views of the city and Hudson River. Residents enjoy numerous amenities and experiences within the building. These include a 3,000 square foot fitness center, a 75-foot lap pool with adjoining hot tub and cold plunge, 40,000 square feet of beautifully landscaped private green space, an entertainment lounge, a children’s playroom, and a full staff including a doorman and concierge. The luxury doesn’t stop at the door. All that the West Village has to offer—the parks on the banks of the Hudson River, leisurely strolls to Greenwich Village, and more—are just steps away. Robert Fox and Richard Cook, both formerly principals at award-winning architecture firms, joined forces in 2003 to create Cook + Fox Architects. Together, they have built a team of passionate, talented professionals who are pursuing a transformative vision: beautiful design shaped by a strong connection to place, serious standards of sustainability, and a commitment to excellence enriched by the collaborative process. When approaching a new project, the Cook + Fox team extensively researches the site, investigating its history and contemporary surroundings. Informed by this architectural and natural context, a design can emerge with a strong sense of place that reflects and even enhances the local environment. Drawing inspiration from artistic and literary sources as well as the natural world, they strive to design buildings that engage the past while looking ahead to the future. The firm designed the Bank of America Tower at One Bryant Park in New York, which became the city’s first LEED Platinum-certified office building. Plaza Construction Corporation is a full service organization with a staff of industry professionals dedicated to providing the highest quality of construction management/general contracting services through the use of diligent coordination and proven reporting systems. Plaza’s combined technical experience enables them to assist with the development and implementation of all phases of a construction program. Originally founded as the construction division of Fisher Brothers, the firm was independently incorporated in 1986. Today, under the leadership of Steven Fisher (Chairman and Chief Executive Officer) and Richard Wood (President), Plaza has established a tradition of integrity in construction, a core value derived from Plaza’s parent company. With annual volume in excess of $1.4 billion, Plaza’s professional staff is comprised of 450 architects, engineers, project managers, estimators, accountants, superintendents, and other support staff. 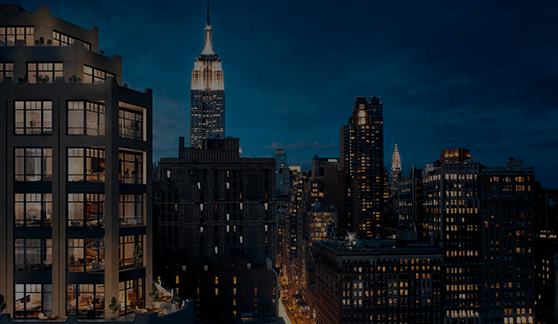 Their notable NYC residential projects include 170 East End Avenue, Astor Place Condominiums, Park Imperial Condominiums, Superior Ink Condominiums, and The River House in Battery Park. Alan Wanzenberg’s architecture and interiors are celebrated internationally, nationally, and at home in New York for their invitingly livable sense of luxury and deep-rooted authenticity, always meticulously realized with an emphasis on superior craftsmanship. Mr. Wanzenberg has been praised for design excellence in The New York Times, Elle Decor, and Vogue, and serves on the Board of Governors of Parsons The New School for Design. He has been repeatedly named one of Architectural Digest’s Top 100 Designers and Architects. Mr. Wanzenberg has conceived designs for some of New York City’s most successful and desirable new condominium developments, including 150 Charles Street, 515 Park Avenue, The Hubert, and Chelsea Enclave. Dirtworks Landscape Architecture, PC was founded on the belief that excellence in design can heighten life’s experiences, offering opportunities to connect to oneself and to the larger world. The practice is dedicated to enhancing the essential human quality of identity by creating spaces that bridge differences in age, ability, and culture through enriched shared experiences. Their varied, notable body of work includes the New Parliament House in Canberra, Australia, the University of Virginia Health System Master Plan in Charlottesville, Virginia, and Rockefeller Center in New York City. Silverpeak is a multi-strategy investment platform with expertise in the real estate, energy, and credit sectors. Founded in 2010, they have acquired more than $17 billion of gross asset value across industries, sectors, and locations. Committed to creating long-term value for their partners and the companies they invest in, Silverpeak uncovers unique opportunities and supports them with targeted capital and market expertise.